A few weeks ago, I posted a recipe for Fresh Corn Papdi Chaat. I made this to celebrate the monsoons. 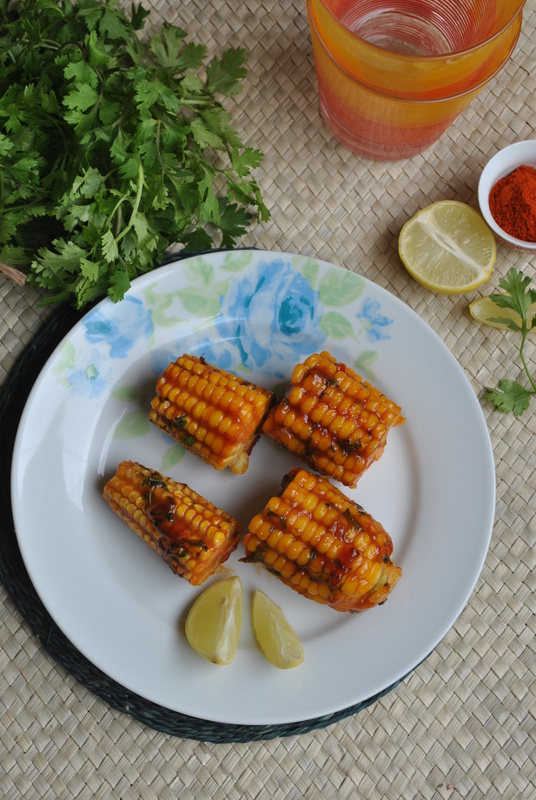 In the parts where I live, fresh corn on the cob is still available and the recipe I am sharing here is one of my favourite ways to eat it. I first had this at a party at our friend DJ’s place. this was the first time I tasted boiled corn with a coating of spicy sauce and it was phenomenal. I asked his wife M for the recipe immediately and cannot claim that I remembered all of it. I tried to replicate this from memory. If you like boiled corn, but are looking for something with a nice kick, this is just the recipe for you. Try it and you will never want to go back to eating plain boiled corn! Break the corn into two pieces and boil the fresh corn with a little salt added in a pressure cooker till cooked, about 3-4 whistles. Cool the cooker and remove and drain the corn, set aside. In a pan, heat the oil and add the tamarind paste, red chilli powder, salt, sugar and cumin powder and cook with 1/4cup of water to form thick sauce. Add the boiled corn into this and sauté for 3-4 minutes, turning them over so that the masala coats the corn well. Simmer for 2 minutes, remove and serve hot. Looks and sounds yum! I love corn in all forms. Lately I’ve been having the boiled version a lot. Next time I’ll try it with this mouth watering sauce recipe. I simply luuurrvvvvvvv the idea. gonna make it real soooon!